In keeping with Jefferson's Mission, We Improve Lives, it is our goal to recruit, retain, develop and reward highly-qualified employees. If you are enthusiastic, caring and dedicated to service excellence, we invite you to consider joining Jefferson. 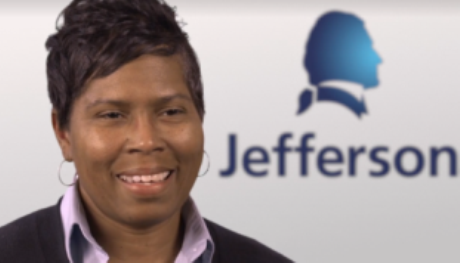 Jefferson encourages its employees to expand their knowledge and develop their careers through growth opportunities and continuing education. Learn about exciting opportunities for nurses at Jefferson, to be a part of a MAGNET designated institution where you can grow and advance your career in a supportive environment. Learn what kind of positions are available at Jefferson and about their departments. We are proud of our distinguished faculty who represent a diverse population from across the world, who have come to Jefferson to educate tomorrow leaders. Jefferson offers a wide variety of staff and management level positions and we invite you to explore the exciting opportunities to be part of the team. Jefferson researchers are making progress every day to advance science and healthcare. JeffTemps is our temporary staffing agency within Jefferson that places applicants in a variety of departments seeking temporary workers. Our volunteers support our mission throughout the organization and we are extremely grateful to have their dedication and support. Jefferson is a MAGNET designated facility, with an exceptional Nursing program that strives to enable our nurses to provide high quality patient care. Campus Currency is the innovative way to make cash-free purchases simply by presenting your Jefferson ID Badge. The cashless campus environment allows purchases to be made on campus and at participating merchants. For being a Jefferson employee, you can enjoy savings on cell phone plans, computer purchases and even transportation with discounts on commuter services. This program provided through the Department of Professional and Continuing Studies in Jefferson College of Health Professions offers a wide selection of credit-granting courses in health careers for working adults. Employees enjoy working in an environment that embraces different cultures and celebrates diversity. Every month, a group of novel enthusiasts get together to discuss the latest read. One of Philadelphia’s busiest transportation hubs, Jefferson Station is in the heart of Center City and provides easy access to campus just a block away. Faculty and employees are able to recognize each other through our online rewards & recognition program, and earn points to be redeemed for rewards. Our caring and grateful co-workers create an environment of trust. Jefferson’s medical plan is a platinum designated plan by the government for offering high quality providers and services for our employees. Through Jefferson’s voluntary benefits program, employees may elect pet insurance using payroll deduction. Whether front desk staff, physicians, transporters, researchers or security, our patients and students consistently compliment how nice everyone is that works at Jefferson. Every year, more than 80 Jefferson physicians are named to Philly Magazine’s Top Docs list with this high distinction. We are active within the Philadelphia community, whether it’s offering health screenings or preparing refugees to acclimate to the United States, we are extremely proud of our employees who volunteer. It’s easy to take advantage of the many restaurants and local eateries in Center City Philadelphia, all within walking distance to Jefferson’s campus, from your high end chefs to food truck favorites, they’re all just steps away. A new modern facility that opened with the sole purpose to provide a place for staff, physicians, students – everyone – to innovate and create the newest technology or product, with the support and guidance all entrepreneurs and inventors need. As a leader in healthcare, we’re also proud of our employee wellness program, offering a discount on your health plan for completing activities to help you improve your health. Many employees take advantage of Jefferson’s tuition assistance program to get that degree they’ve always dreamed about or go back to College or higher education. Jefferson is a Power Partner with the Philadelphia Reads program where our employees volunteer on their lunch break to read to underperforming grade College children. Jefferson is the first organization in the region to offer this highly rewarding fitness program that creates a personalized workout program and nutrition counseling for each participant. Click the logo above to explore the various vibrant neighborhoods of Philadelphia with an interactive map. Click the logo above to explore the towns and countryside just outside of Philadelphia. 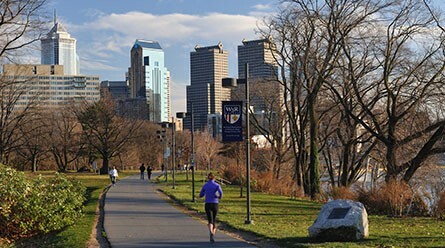 Philadelphia is home to more than 180 parks with over 200 miles in trails and recreational walkways for its residents to enjoy. 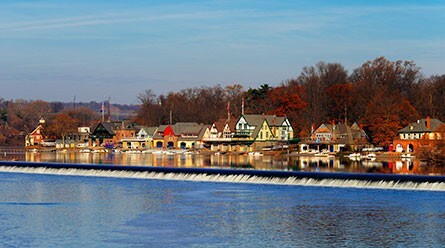 View from across the Schuylkill River of Boathouse Row. 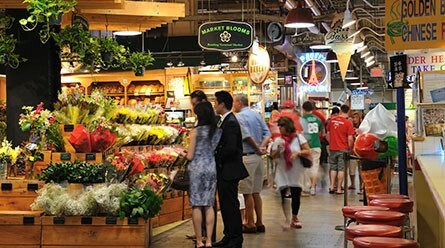 At Reading Terminal Market, over 100 merchants offer fresh produce, meats, fish, artisan cheese, ice cream, flowers, baked goods, crafts, and specialty and ethnic foods.